When you board the Gondola to ascend to the peak of Vancouver known as Grouse Mountain you immediately are whisked away to a magical place. When you exit the ride which takes you up the Grouse Grind you are met with much colder temperatures and on a clear day a view of the city of Vancouver which is unmatched. Imagine stepping off that ride and hosting all of your guests in the most beautiful place on earth for your wedding. Such was the case for this bride and groom who were treated with one of the most beautiful sunsets we had ever seen at this mountain resort. 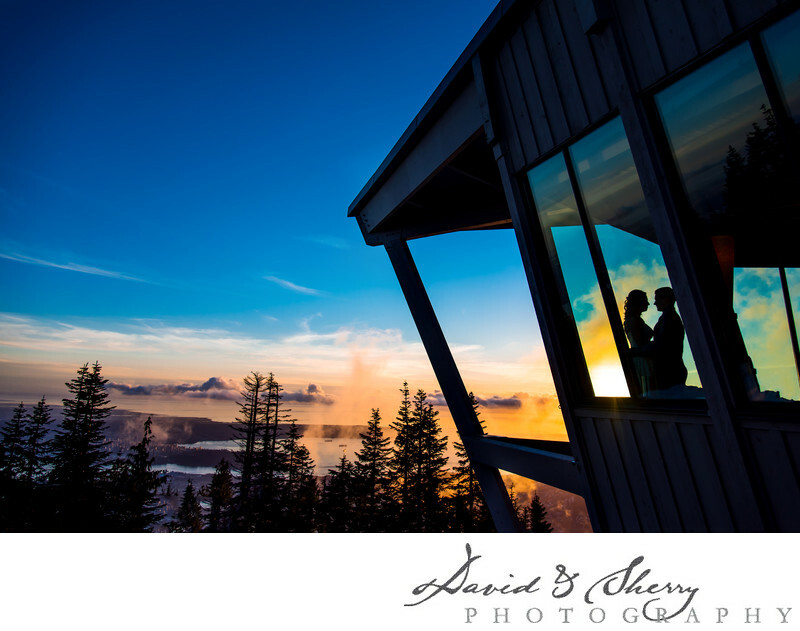 Grouse Mountain Wedding Photography can be the most rewarding as you are met with the challenge each time of capturing the moments and emotion from weddings that can be a small gathering or a large party of 500+ people. A photographer must be prepared to be indoors our outside, in a tent or in the chalet as they have many different meeting spaces where a wedding can be hosted. A couple can be taken by chairlift to the peak of the mountain or can go for a stroll along the many hiking trails with stunning views. In this wedding picture we used the sunset that was bright orange over Howe Sound and silhouetted our bride and groom in the chalet window which is one of the most beautiful pictures we have ever taken at weddings. It was 10 degrees down below and once we took the gondola up to he peak the temperature rested at -1 for a perfect winter event. The ski resort was still open and the family day weekend events were in full swing which gave us many opportunities to photograph beautiful white snow as our backdrop, sunny views and blue skies and because it was mild we were able to spend quite a bit of time outside for our photo shoot without getting cold. Once we did come inside to the cozy warmth of the banquet room, family and friend have made their way to the hill to celebrate Caleb & Shar's love for each other. This Christian wedding took place in front of the fire place at dusk and a delicious buffet dinner was provided afterwards while we laughed and joked well into the evening. Grouse Mountain is one of the most unique and perfect venues to be able to completely getaway from the city while not having to travel too far. As one of the preferred vendors at Grouse Mountain we can review this as being the best wedding venue in B.C. Location: 6400 Nancy Greene Way, North Vancouver, BC V7R 4K9.